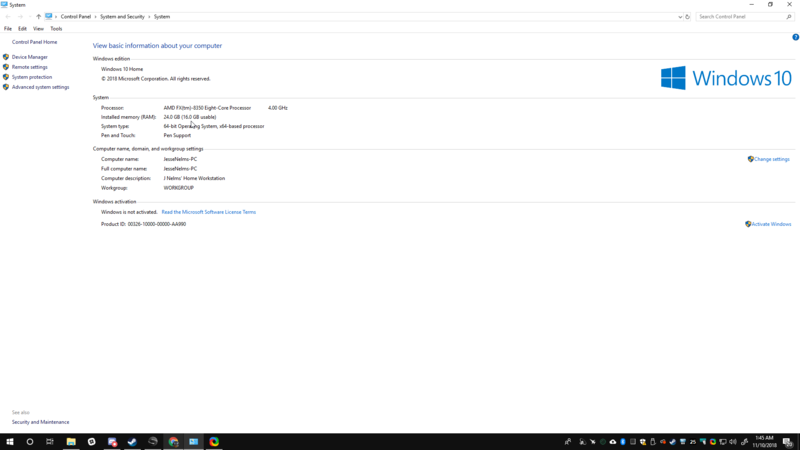 Win 10 Home supports up to 128GB RAM. I'm thinking this is a disparity in your RAM config. Exactly what RAM sticks do you have? That is probably caused by your choice of memory. Whatever that is. There are 4 sticks total 8 + 8 and 4 + 4 they are paired by the color-coded slots. IE the 2 8s are in blue slots while the 2 4s are in the black slots. According to the book the Blue slots are for channel A and the black slots are for channel B.
I have tried MSconfig as well as deleting all of my pagefiles from the performance settings. "Exactly" meant make/model as well. Often, mixing RAM sticks does not work well. This is why they are sold in specific sets. 8+8 and 4+4 was not sold as a set. And that is why. Mixing brand and speed. Each set works fine on its own, but not all 4 together, correct? Sadly, that is often the case. At some point, Windows kicked it down to 12GB which made me think it was like only accessing 2 sticks at a time. Okay so I bought 2 more Gskill sticks DDR3-1866 8GB each and I have a similar issue 24 usable of 32 GB I tested each stick on it's own and the computer booted fine.